This second episode had a much harder job than the premiere, which played very much like a short movie sequel to the first two Evil Dead films. "Bait" is where things truly begin, in terms of trying to ensure audiences this franchise can work as a long-running television series. 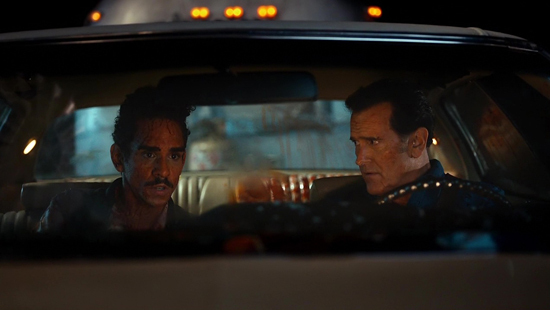 The plot isn't much—Ash (Bruce Campbell) and Pablo (Ray Santiago) race after Kelly (Dana Delorenzi) in his trailer, as she's absconded with the Necronomicon to deal with her resurrected mother (Mimi Rogers). It turns out that Kelly's mother has a plausible explanation for her return from the dead, and isn't a white-eyed frightening Deadite, leading to an awkward family reunion dinner that a sceptical Ash and Pablo are invited to. These episodes are only half-an-hour long—or 27-minutes excluding adverts and the 'Inside Ash vs. 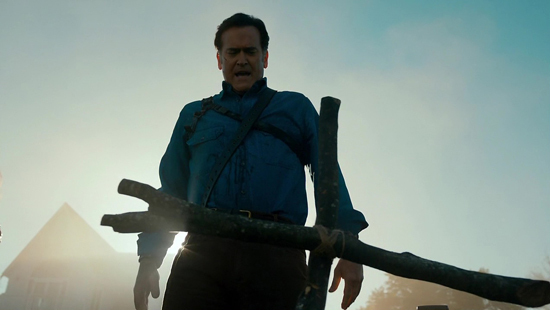 Evil Dead' featurettes that accompany each instalment. This means there isn't really enough time to delve deep into a story, knowing full well that the fans just want to see Ash chain sawing demons apart with cheesy kiss-off lines. It feels like AvED's story is going to benefit from the cumulative effect of its weekly episodes, so might actually work best as a binge-watch. I enjoyed "Bait" because it didn't outstay its welcome and managed to deliver the blood and gore everyone wants (a blood-soaked attack involving a broken bottle, another graphic decapitation), but those scenes were tempered by more down-to-earth funny moments. I particularly liked Ash's pep talk to Pablo about the plan to rescue Kelly, and his mistrust of Kelly's mother at the dinner table. And in a subplot, Detective Fisher (Jill Marie Jones) is now hot on the trail of Ash and discovers a clue to the book store he's planning to have the Necronomicon translated. There was no sign of Lucy Lawless's mysterious Ruby this week, but it's perhaps wise the show isn't overburdening the thirty-minutes it has every week. So far, so good. "Bait" wasn't anywhere near as much fun as the premiere, but it had a much tougher job and succeeded in making it feel like AvED might actually work as a supernatural road trip where a 'father' (skilled in the art of vanquishing undead creatures) effectively teaches his two 'kids' how to protect themselves in this crazy new world they find themselves in. AvED doesn't feel like it's going to outsmart its contemporaries when it comes to narrative complexity and character arcs (this is no Sleepy Hollow), but it knows its strengths and is finding a way to make those work in different medium that demands a bit extra.